Hello Users, We are back with one very interesting loot for our visitors. We have found one more Fantasy Sports Game. It is far far better than Dream11. This fantasy league is called Halaplay where you all can win unlimited cash daily. IPL is already started so its time to earn money good money from this IPL. Read all details about HalaPlay Fantasy League Here. HalaPlay is a Daily Fantasy Sports (DFS) platform that empowers serious and casual sports enthusiasts to play cash based quick, simple and interesting games. 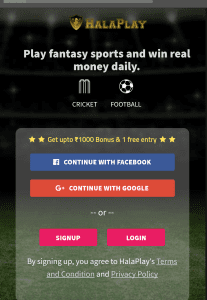 DFS is the shortest and quickest version of fantasy Cricket where users can create a team, enter leagues and win cash prizes at the end of every game. Yes! Every game! Now there is no need to wait for a season to get over to earn prizes. So start playing Halaplay Fantasy League. Now, Click on Sign up with Google or Facebook. Now, Enter your Username, Verify Mobile number and Referral code to get earn an extra Rs 50 signup bonus. Done!! 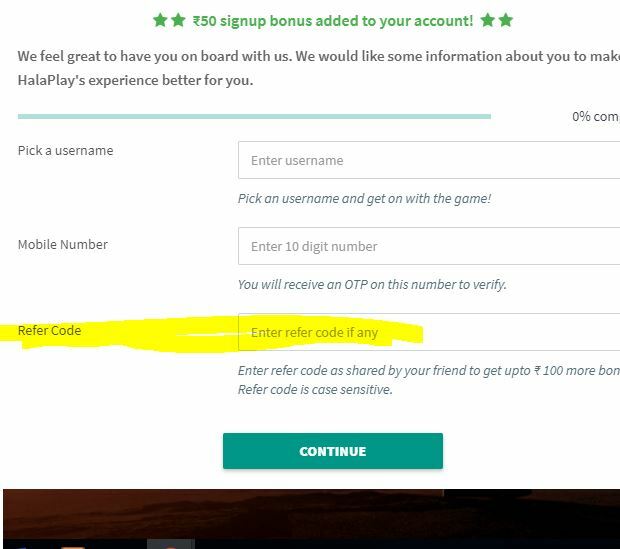 You will get Rs 100 Sign up bonus in your HalaPlay account. After following the above steps you were on the Dashboard of Halaplay website. Now, Click on any match that you want to play. Create 11 players team. Choose captain and vice-captain. Join any league that you want to join. If your players perform well in the real Match, you’ll rise up the rank and win prizes according to your league. Click on Refer & Earn. You can share your Refer Code and Refer URL with your friends and family using WhatsApp or Facebook. You and your friend will earn Rs.50 when they join Halaplay using your refer code (Your friend earns Rs.50 extra as a signup bonus!). That money cannot be withdrawn. Its a useless trick.